Dorothy Duncan has worked with organizations across Canada and around the world to ensure that Canada’s culinary history is recognized, researched, and recorded. 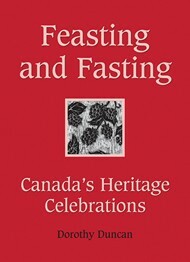 In 2007 her book Canadians at Table won the Cuisine Canada and University of Guelph Culinary Book Gold Award. Nothing More Comforting, Dorothy’s first book for Dundurn, was published in 2003 to wide acclaim. Dorothy always brings some authentic culinary samples for her audiences.